“What will your mother-in-law say? You don’t even know how to boil dal,” my mother would fret during my growing up years in Calcutta. Strangely, she never actually required me to enter her kitchen or help with chores in any way. “No, no, go study,” she would say. Perhaps we both had an inkling of what lay in my future: a kind mother-in-law who would teach me to make the most glorious toor dal preparation ever. 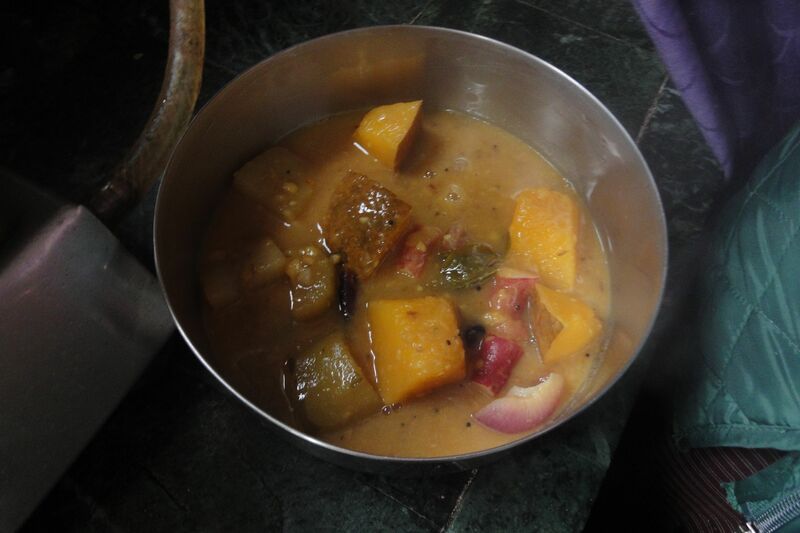 Namely, a mouth-puckering, sweet and tangy golden lentil stew studded with pieces of lauki or green bottle gourd, chunks of pumpkin, and large pieces of sweet potato, called pappu charu. Pappu means dal in Telugu. I have no idea what the word charu means, but to my happy taste buds, the word always sounds like “lovely and pleasing.” Therefore, a lovely dal that pleases. This dal is sweetened with gur or jaggery and its sour taste comes from a generous dollop of tamarind fruit paste. I especially enjoy making (and eating) pappu charu in the fall when the markets are bursting with fresh pumpkin, butternut squash and sweet potatoes. I love the bits of vegetable in this dish and enjoy “fishing” them out and mashing them with my fingers into the dal. While cooking, it is important to boil the vegetables with tamarind and jaggery in order that they imbibe the flavors of both. 1. Dal: Boil the toor dal in a pressure cooker, with water:dal in the ratio 2:1. Remove cooked dal from the pressure cooker and set aside. 2. Vegetables in tamarind water: In the pressure cooker, add the tamarind water (never whole dry tamarind) and all the vegetables. Then add water until the vegetables are slightly submerged in the water. A 5-litre pressure cooker, for instance, should be about 1/3- 1/4 full. Remember that these vegetables also give off water while cooking so you don’t want too much water in the cooker. Add 1/2 tsp of salt, turmeric, about half the jaggery and the sliced green chillies. Bring to 1 whistle on the pressure cooker, and set aside. Alternatively, boil this mixture on the stove until the vegetables are soft. I tend to prefer stove boiling as the pressure cooker can sometimes overcook the vegetables. 3. For tarka: Heat the oil in a small pan, and add the tarka spices in this order – first garlic, urad dal, fenugreek seeds and mustard seeds. Wait for a few seconds until the garlic turns slightly golden. Next, add the cumin seeds, dry red chillies and asafoetida. Let the cumin seeds sputter for a few seconds. Remove from flame. 4. Add the boiled dal and tarka to the tamarind-vegetable mixture, along with the green curry leaves. Note: add the dal slowly, as you want a runny stew. If there is too much dal, the mixture gets too thick and tends to lack flavor. Stir gently, so that the vegetables don’t disintegrate. Add salt and the remaining jaggery, both to taste. Bring to a boil, and allow the stew-like mixture to boil for a few minutes. Serve hot with basmati rice.